Got a rodent problem? We can help! Just One Bite rodent control products kill house House Mice, Norway Rats, and Roof Rats. To successfully control your rodent problem it’s important to know exactly what type of rodent you’re dealing with. Whether you have just one mouse or an infestation of rats, knowing your enemy is the first step to taking back your home or barn. At Pasturas Los Alazanes, we recommend Just One Bite for rodent control. With products designed for inside and outside your home or barn, we’re sure you’ll find the right product to fit your needs. Bait Station – Preloaded disposable bait station with a low profile design allows for easy placement behind stoves, refrigerators, under furniture, inside cabinets and in other hard to reach places. Bait Blocks – Weather-resistant blocks for use inside and outside of agricultural and industrial buildings. 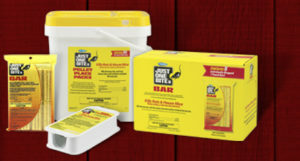 Pellet Place Packs – Fast and effective indoor and outdoor rat and house mouse control. Bar – Individually wrapped bars can be broken into 2 oz mini-bars for multiple placements. Bait Chunks fit in burrows, runways and hard-to-reach areas and can be used in bait stations. Pellet Place Packs – No-touch pellet place packs for use in burrows, runways and other hard-to-reach areas. Pick up Just One Bite mouse and rat poison at Pasturas Los Alazanes in Dallas, Balch Spring and Forest Hills, Texas. This entry was posted on Monday, April 8th, 2019 at 4:11 pm	and is filed under News & Updates. You can follow any responses to this entry through the RSS 2.0 feed. You can leave a response, or trackback from your own site.